I'm trying to solve a 3x3 magic square for 99 which starts at 29. I got the rows, columns and one diagonal but the other diagonal is (way) off. Is there even a magic square which satisfies both diagonals for these parameters? 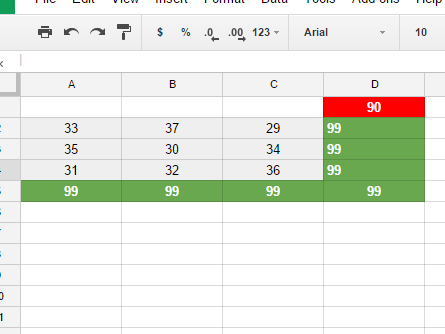 As you can see I've been playing around in a spreadsheet, moving numbers around. But is there a quicker way to spot if a magic square for a number starting at an arbitrary number is possible? It might interest you that one of Ramanujan's first hobbies was trying to understand magic squares, and they appear in his first notebook often. I always construct it in following manner and it works, I don't know whether there is alternative way to do this or what's proof of correctness of my construction. Not the answer you're looking for? Browse other questions tagged number-theory magic-square or ask your own question. Fewest required values in magic square? $4\times4$ magic square magic number possibilities? do you know another Magic Square with this property? How to prove that there are infinite number of magic squares consisted of only consecutive prime numbers? Can there be a magic square with equal diagonal sums different from equal row and column sums?